AutoCorrect: This function corrects common typos and capitalizations. It also inherited many of the old AutoText features from previous versions of Word. AutoText Building Blocks: This function lets you insert preset chunks of text. 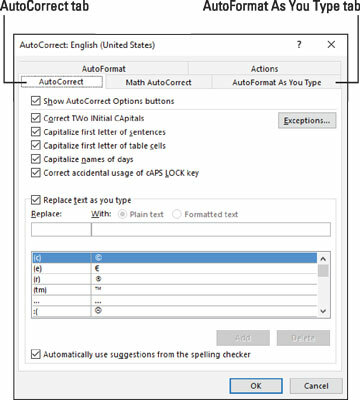 It’s not the same as the old AutoText feature, which is not available in Word 2016. AutoFormat: This feature lets you format your document in one operation. It’s a holdover from earlier versions of Word. The AutoFormat command isn’t even found on the Ribbon. It’s easily confused with the AutoFormat As You Type command. AutoFormat As You Type: This function deals with formatting text, applying similar paragraph styles (bullets, numbers, and so on), and converting individual characters to their proper equivalents (such as ½ for 1/2). Two Auto commands you might be familiar with, that aren’t in this list, are AutoComplete and AutoText. These commands were popular in older versions of Word, but are unavailable in Word 2016. Don’t let yourself become confused over the sloppy way the Auto commands are organized, or how some of them are familiar yet no longer available. If you’ve used Word for any length of time, you might find that confusion oddly comfortable. As a consolation, all these commands are headquartered in the same dialog box, as illustrated. Choose Proofing from the left side of the Word Options dialog box. On the right side of the dialog box, click the AutoCorrect Options button. Behold the AutoCorrect dialog box. Of the five tabs shown in the AutoCorrect dialog box, you need to concern yourself with only two: AutoCorrect and AutoFormat As You Type. As a shortcut to the AutoCorrect dialog box, look for the AutoFormat Options or AutoCorrect Options icon in your text. You can quickly access AutoFormat or AutoCorrect settings from that icon. The Math AutoCorrect tab provides an extension to the AutoCorrect (old AutoText) entries — specifically, to conjure mathematical symbols. If you understand these symbols, click the tab to review its repertoire. Options on the Actions tab are normally disabled. They can be used to provide extra commands on Word’s right-click shortcut menu. The commands appear on the Additional Actions submenu. For example, you can right-click on a date and choose Additional Actions →Schedule a Meeting. The biggest question most people ask is why are two AutoFormat tabs available in the AutoComplete dialog box? The AutoFormat tab relates to Word’s AutoFormat command. Don’t bother looking for that command on the Ribbon; it’s not there. So you can ignore the AutoFormat tab. The one you want to pay attention to is AutoFormat As You Type.